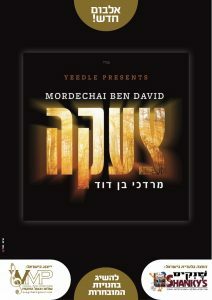 In 2012, MBD released an album called ‘Kissufim’. It was to be his final album, saying that he planned to move to Yerushalayim and basically retire, at least from the studio. Apparently, when you’re the king of Jewish music, stepping down is easier said than done. He certainly never stopped rocking concert stages around the world. I had the pleasure of enjoying performances both here in London and in NY. On both occasions, he had the audience on their feet! And somewhere along the line, something, or someone (fan pressure? ), convinced him to go back into the studio. And here are the results. Personally, I found his last album a bit disappointing. But this time around, Mordche pulled out all the stops, bringing it up to the level of Kulom Ahuvim from 2009 with top composers and arrangers (Lots of stuff from Yitzi Berry and Eli Klein). And at 60 something, his voice is clear and strong. this time around, Mordche pulled out all the stops, bringing it up to the level of Kulom Ahuvim from 2009 with top composers and arrangers (Lots of stuff from Yitzi Berry and Eli Klein). And at 60 something, his voice is clear and strong. Composed by MBD and arranged by Yitzi Berry and Eli Klein. classic straight rock song, of thanks and praise to Hashem, to kick things off. Some nice acoustic guitar thrown in and interesting change of beat for the low part the second-time round. Not my favourite song, but a nice one all the same. By the way, a shout out to the Shirah Choir who, as always, did a fantastic job doing backup throughout the album. Mordche took this nice kumzitz style ballad to the next level by inviting Motti Steinmetz to join him. The two have sung together on the Rechnitz albums, and they really compliment each other, Mordche with his baritone-bass voice, and Motti with his sweet child-like soprano voice. From the youtube videos of their live performances together, you can see that MBD has a soft spot for this uniquely gifted young man. I, for one, am really looking forward to Motti’s debut album. This song also demonstrates Yitzi’s knowledge of Yiddish- not bad for a Litvak! It took a few listens for me, but now this one has grown on me. It’s based on the words of Rebbe Nachman, who teaches in the name of the Zohar that a cry of teshuvah is affective even if no one hears it apart from Hashem Himself. It’s a techno song in a minor key, which gives it an intense feel, with Mordche (or someone else) screaming quietly during the bridge. All in all, a creative and very powerful song. As MBD wrote in the booklet, this song is a synopsis of the life of his father Chazzan Dovid Werdyger A”H. It sums up his positive attitude to life that he adopted during the holocaust. he made sure to spread that positive energy to his fellow inmates as well. And we’ve all been inspired by his music and the music of his children and grandchildren. Mordche, Mendy, Yisroel and Yeedle all use the musical gifts he passed on to them to give him the nachas he deserves. The arrangement, lyrics, tune and vocals all blended perfectly to create a masterpiece of a tribute that I’m sure Reb Dovid himself is really enjoying. Written for the chasunah of Yeedle’s daughter. A nice, light, catchy dance song. Yeedle sings a sweet little Yiddish shtickel in the middle. Not outstanding, but enjoyable nonetheless. There’s something about Dickman’s arrangements that just grabs the listener by the ear! His rich sound definitely fits this song beautifully. I wasn’t surpised either to discover that this was a Yitzchak Fuchs composition. Again, this song took a few rounds of listening, but it really has grown on me. Arranged by- you guessed it- Eli Klein and Yitzi Berry! New words, timeless message, simple and catchy tune. A great way of reminding ourselves that we can rely on Hashem’s protection always. Nice job guys! I saw a Youtube clip of Yossi Green singing this song live at an event. What spoilt it for me at the time was the fact that I watched another clip earlier that day of someone doing a cover of a Yossi Green song that sounded a bit similar. However, after a few listens, I think I can overlook that small detail. It really is a very touching ballad. In fact, it’s one of my favourites on this album! How many arrangers are comfortable good with live music and techno? Eli Klein and Yitzi Berry are extremely versatile. The proof of that is their work on this album, as well as the variety of singers they have worked with so far, from Benny Friedman to Itzik Dadia to the Malchus choir. This track is a typical Yeshivish nigun set to a live disco beat. May well become a Chasunah hit. A nice relaxing slow song. Nussy Fuchs is an 18 year old bochur and an up and coming star on the kumzitz scene (Google him). I believe he sang on the original ‘Hasturah’ single a couple of years ago. He sings with a lot of neshomah and really adds a lot to the song. Mordche included a nice note for this song in the booklet, pointing out that Dovid Hamelech was showing a great example of how to educate children in a positive fashion, by praising those who kept away from doing the wrong things. a good dance track. Here the strength of the song lies in the unique words, from Yom Kippur davening. Makes me feel as if I’m in shul Kol Nidrei Night davening for my life. Beautiful stuff! This song was recorded some 12 years ago, intended for Mordche’s Efshar Letaken CD and was shelved until now. It starts as a reggae song, but changes to a rock beat later on. Love that brass and organ in the song. Another favourite of mine. So, there you have it: good ol’ MBD is back with the quality, inspirational music he was always known for. Buy ‘Tza’akah’ and enjoy it!